Pour half of the batter into the prepared baking pan. Spread the cream cheese mixture over the chocolate layer. Top with remaining chocolate mixture (this doesn’t need to completely cover the cream cheese layer). Using a knife, swirl the top chocolate layer into the cream cheese to make a marble pattern. 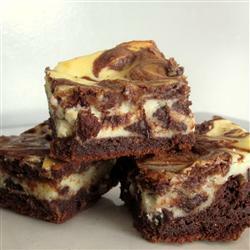 This entry was posted in Food and tagged baking, brownie, Cheese Cake, festive, home cook, simple recipe by Miss P. Bookmark the permalink.